I'm sure many of you already heard the latest news about Windows Phone 7 Series from Scott Guthrie’s Mix keynote this morning. I'm really excited about this, since finally the development tools for WP7 were released after several weeks of waiting. I didn't want to wait too long to post about this, so I went right away to download the tools and created my first windows phone 7 app. The great thing is that any .NET developer became automatically a Windows Phone 7 developer. You can create applications using our beloved Visual Studio 2010 and Blend 4, and the applications can be created using Silverlight or XNA. WP7 supporting Silverlight means that up to 90% of your existing Silverlight application's code is reusable and you only need to tweak the interface to fit the phone's screen resolution, and with Silverlight Out of Browser capabilities (with big enhancements on SL4) you will be able to deploy on web, desktop and phone reusing most of your code. The same goes for XNA. You will be able to deploy your XNA apps on Desktop, XBox and WP7 using pretty most of your application code. Isn't it awesome? 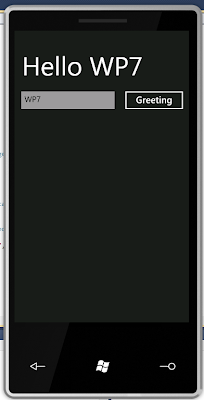 Just as a prove of concept, it took me about a couple of hours to create my first "Hello" greeting app in iPhone using Objective-C, and I had to code the layout to respond to orientation. I did the same with the Windows Phone 7 tools, and it took me 5 minutes to get the same application up and running in the WP7 simulator. 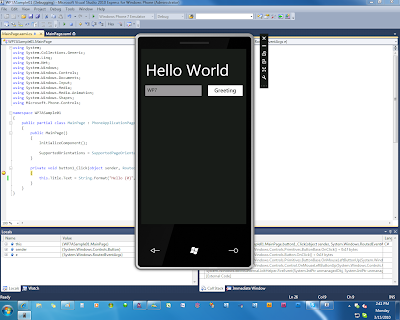 This is a screenshot of the WP7 simulator running while you can see my Visual Designer and XAML windows opened in the back. 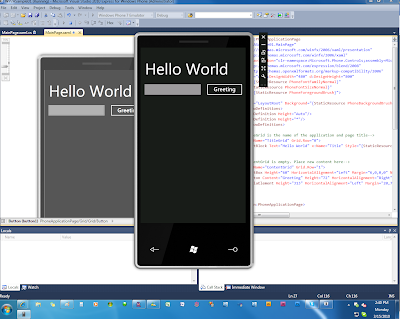 In this screenshot you can see how easy is to debug our WP7 application. In the background you can see my code bihind window with the active breakpoint. All the same skillset, all the same tools and an exciting new platform to develop and do amazing things. I'll keep you posted with more on Windows Phone 7 !!! By the way, check out this links giving you all the information you need to start developing for Windows Phone 7 series.